Clergy and servers after the final Solemn Mass of the conference. 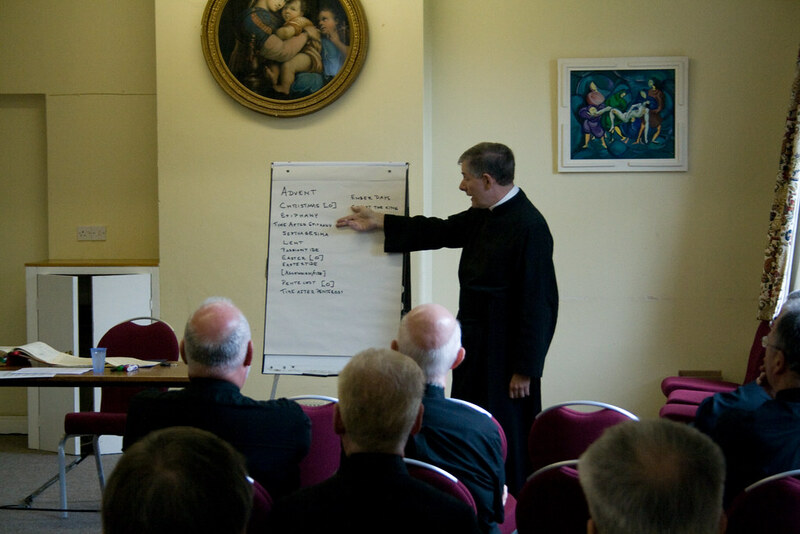 The London Colney conference is the fourth residential Priest Training course the LMS has organised, in three years. The support of this course by the Archdiocese of Westminster led to some pretty dubious coverage from The Tablet, which earned a rebuke in the following issue from Bishop Alan Hopes, an auxiliary of the Archdiocese who coordinates matters with the LMS. In a nutshell The Tablet interpreted Archbishop Nichols' endorsement of the conference as a way of bringing a group of dangerous lunatics under some kind of control, in order to stop them initiating a 'culture war' within the Church. Bishop Hopes pointed out rather percipiently that their uncharitable remarks were themselves an example of the waging of a 'culture war'. It is highly unusual for bishops to respond to The Tablet's barbs, and Bishop Hopes' letter is very significant. 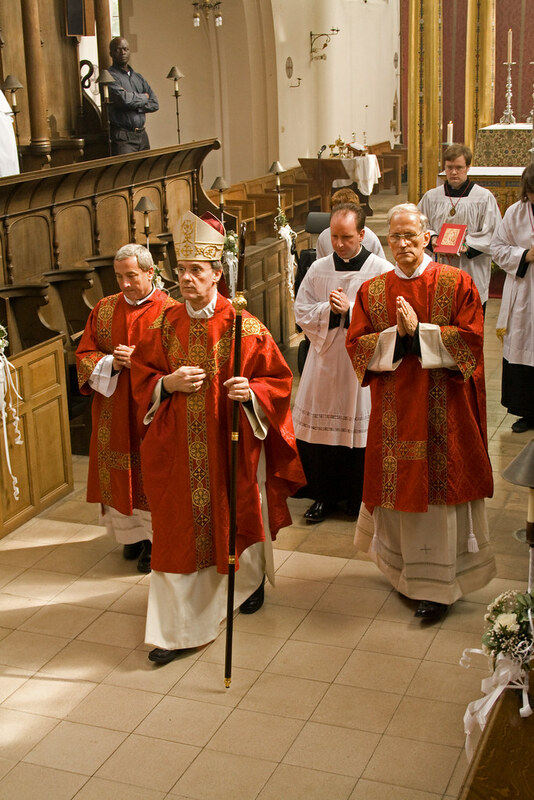 Regular readers of The Tablet are all too familiar with this war, which involves attacks on the Holy Father and any Cardinal, Bishop, priest or lay group or individual who does not toe their line on how the Church should jettison all her teachings, liturgical practices, and discipline, in order to join the latest fad. There is a wide legitimate debate in the Church about how best to proceed in preaching the full and authentic gospel in the uniquely difficult times we live in. It is important for all sides to respect the sincerity and hard work of those taking a different approach to their own in this debate, even when it is a radically different approach. The Tablet is not part of this debate, however: it attacks all sides of it. Their attempt to drive a wedge between the Holy Father and the Archbishop of Westminster he so recently appointed, with a number of other recent outrages such as the call for American bishops to ignore the fate of the unborn when considering the 'common good' (common to whom, we might ask? ), has led to calls for the editor and sub-editor to resign. What will happen to The Tablet I do not know. Life is too short to bear grudges, however, and we were happy to welcome a Tablet journalist, Christopher Lamb, to the conference dinner on Thursday. 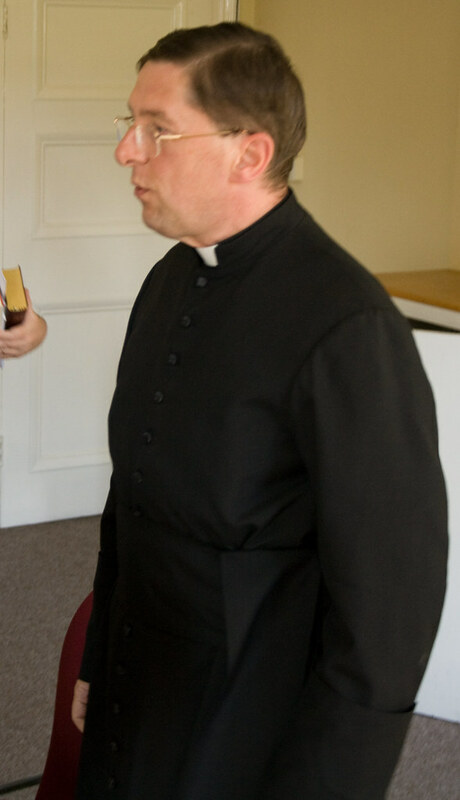 Fr Michael Cullinan after giving his lecture at the conference. The endorsement of the conference by the Archdiocese was real enough, whatever The Tablet might say. Bishop Arnold celebrated Mass (OF) on the Monday the conference started, with his own team of servers and deacons. 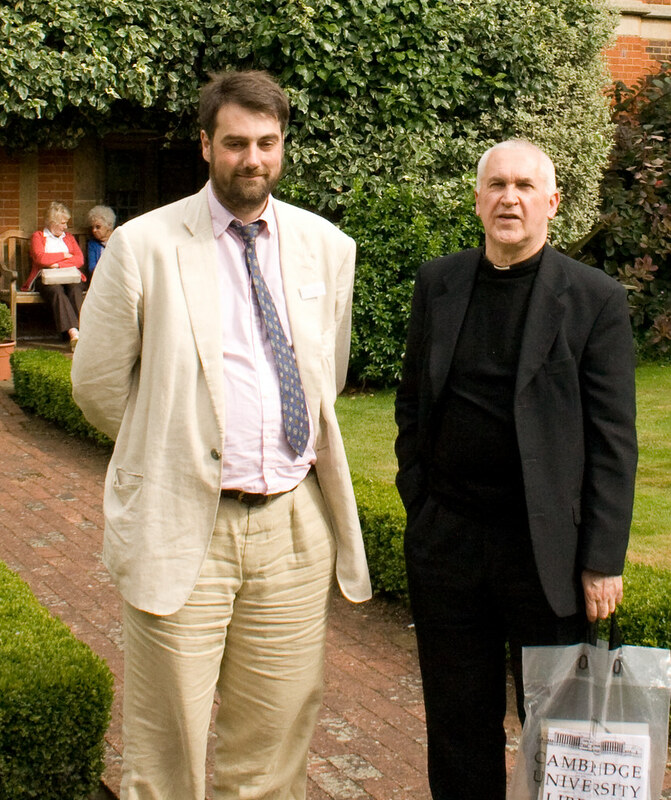 Among others we had lectures from Colin Mawby, a former Director of Music in Westminster Cathedral, Fr Aidan Nichols OP (who called for the Sarum Use to be used in Westminster Cathedral to enlarge the liturgical pluralism of the Latin Church), and Fr Michale Cullinan, a well-known Westminster priest and academic, who recounted his own long-term attachment to the Traditional Mass and discussed the 'hermeneutic of continuity' applied to the older and newer usages of the Roman Rite. Bishop Hopes, on behalf of the Archdiocese, took a particular interest in the planning of these lectures. Fr Pendergraft of the Fraternity of St Peter giving a talk on the 1962 calendar and lectionary. I knew from its rather prejudiced leading article what The Tablet expected it to be like. I had some anxieties of my own, but now that the Holy Father has de-politicised the extraordinary form of the Roman Rite, I decided it was time to learn to celebrate it properly and so I have come on the course. I am very pleased I did. 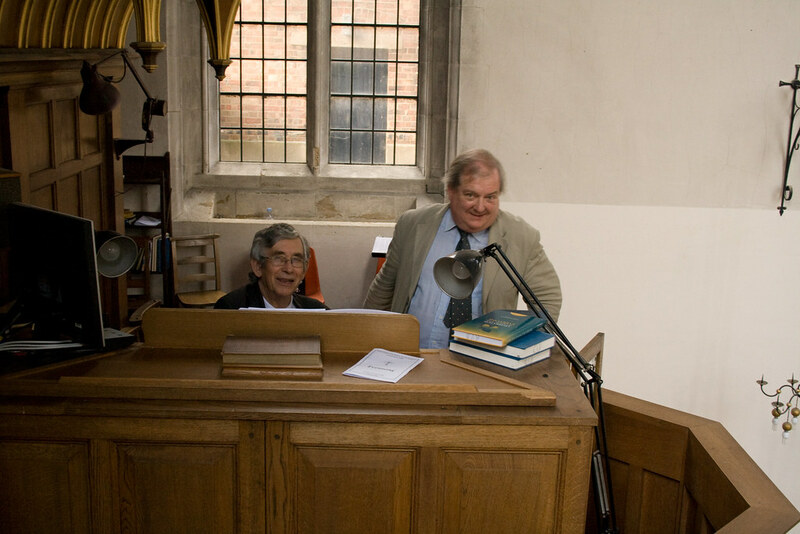 Colin Mawby, left, at the organ, and Charles Finch who directed his choir, the Cantores Missae, for the conference Masses. I think it is a tribute to the wisdom of Pope Benedict that this course on the extraordinary form is filled with ordinary priests - I mean priests who clearly have not come here because they are desperate to ally themselves to some faction, but who are working in perfectly average parishes the length and breadth of the country and who find themselves drawn to the reverence of the older form in order to nourish their priestly lives and thereby to foster the devotion of some of their congregations. It is not full of priests plotting to undo the Second Vatican Council, discussing the length of maniple fringes or the claimants to the Bourbon throne, just run-of-the-mill priests who feel that celebrating the extraordinary form once in a while could help them in their particular quest to be good, devout priests, or who are learning it in response to the pastoral needs of their congregations. For these reasons alone, there is nothing marginal or marginalising about the conference. Monsignor Gordon Read talking to conference participants at a drinks reception. 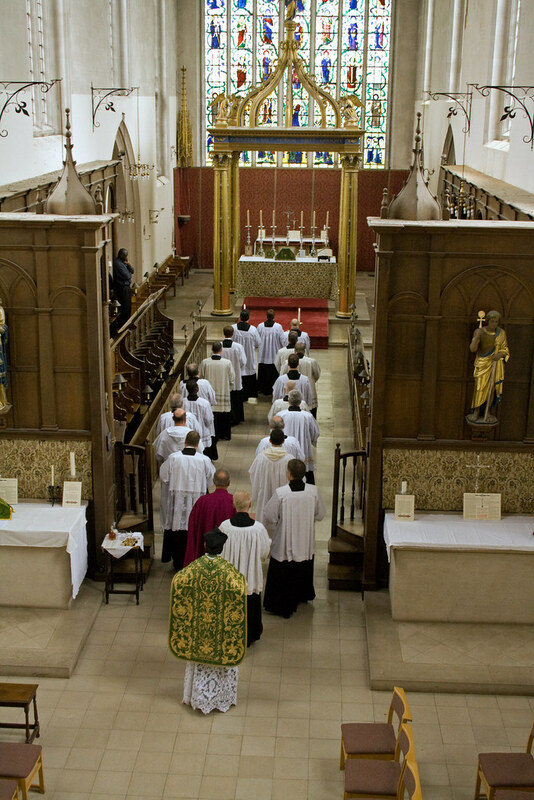 During the London Colney conference, a great supporter of all things Traditional and Catholic in Oxford, where he was an undergraduate, was clothed as a novice at the Norbertine Priory in Chelmsford. Congratulations and prayers for him and for his community. In the course of the week we had either Missa Cantata or Missa Solemnis before lunch, and either Compline or Vespers in the evenings. 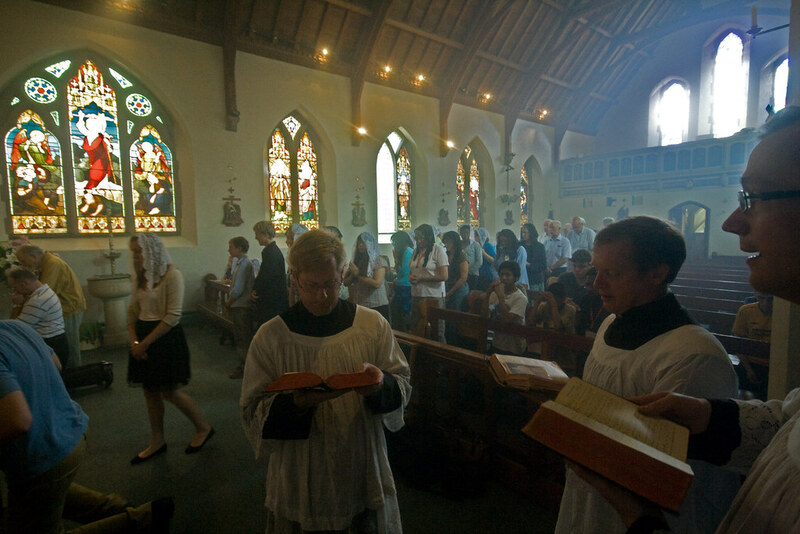 We also had Benediction a number of times. 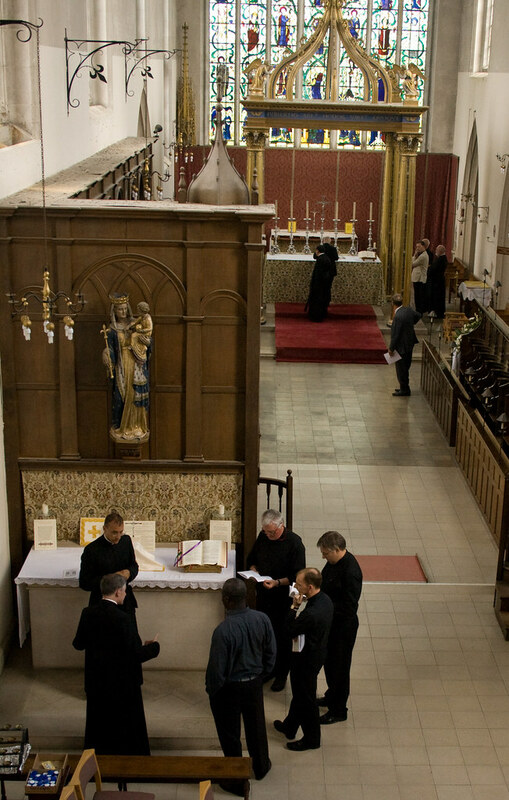 The music was provided by Charles Finch and his Cantores Missae, who sang a number of polyphonic Masses and some Chant ones, as well as all the Chant Propers, and also provided singers for the Offices and Benediction in the evenings. The enormous organ was played by Colin Mawby, who was principally present to teach the priests the chants they need for Sung Masses. I have just come home from the most uplifting experience, of helping out with the Priest Training Conference which took place at the All Saints Pastoral Centre in London Colney (near St Albans). 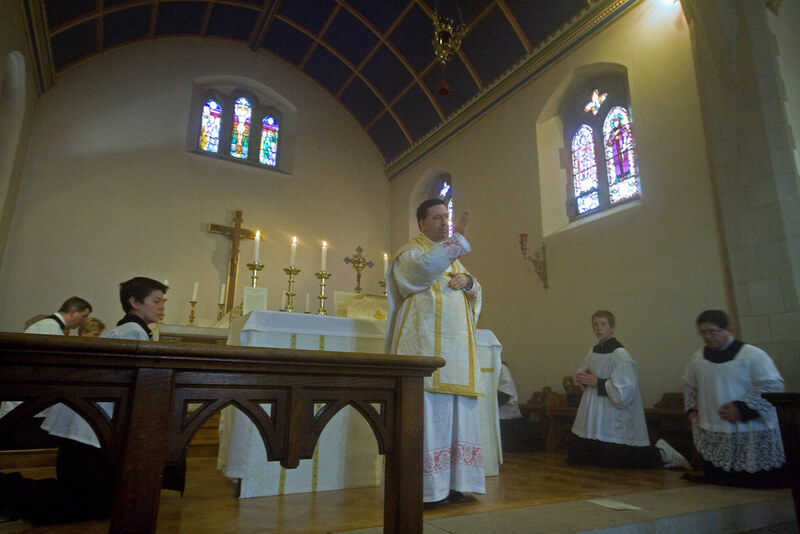 'Pastor Iuventus' of the Catholic Herald was there, and he has beaten me to an early report on the conference in this weekend's paper, but here are some pictures. 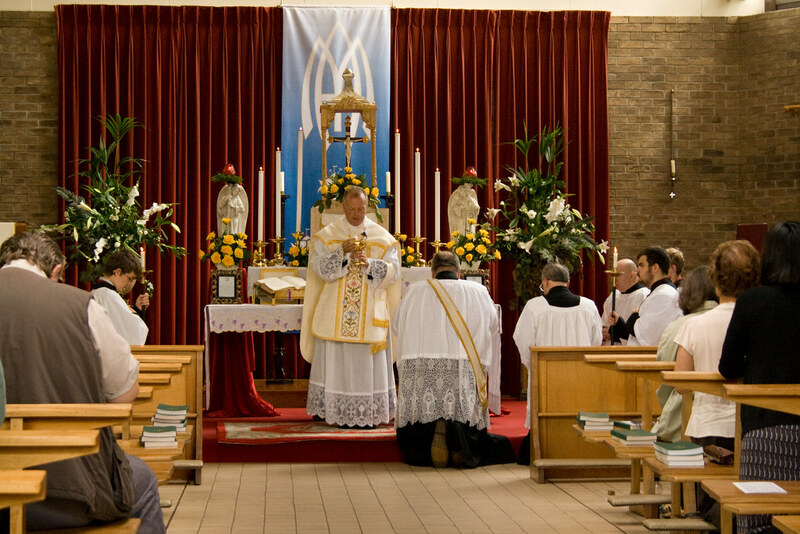 The conference was the first organised by the Latin Mass Society 'in association with' a diocese, in this case the diocese of Westminster. 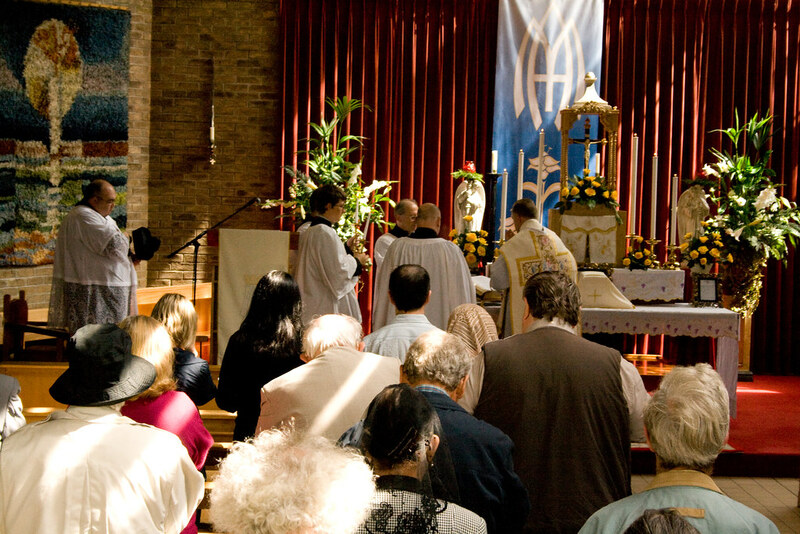 The Centre is in fact owned by the diocese, although the priests at the conference came from all over England and Wales - with two intrepid priests from Africa. 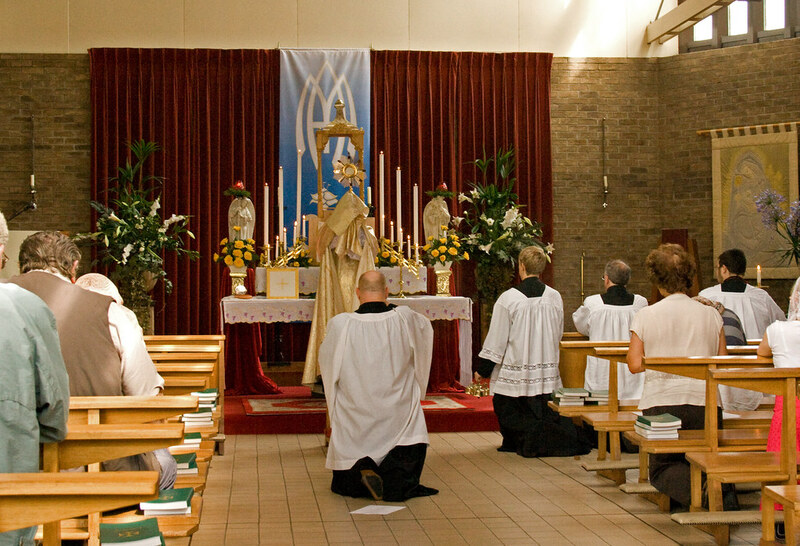 The purpose of the conference was of course to train priests how to say the Traditional Mass, the usus antiquior of the Roman Rite. 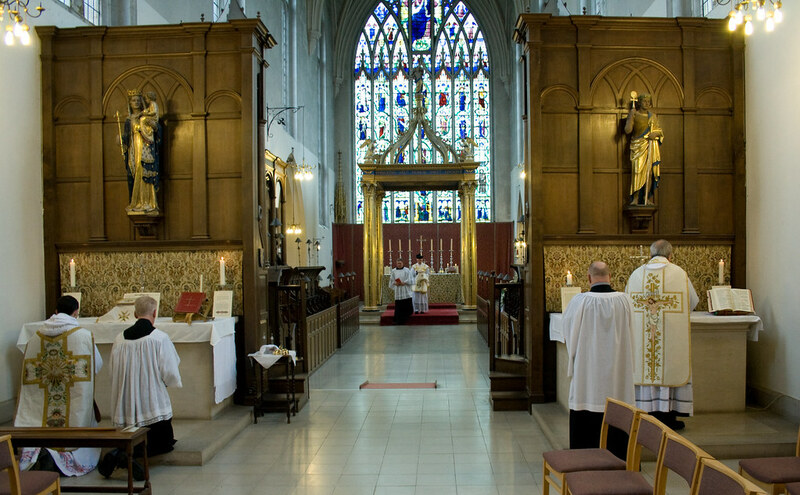 London Colney has a stunning chapel designed by Comper for its first owners, an order of Anglican nuns, which includes two nave altars, a Blessed Sacrament Chapel and an altar behind the High Altar, plus a separate 'Oratory', at all of which Low Masses can be said simultaneously. 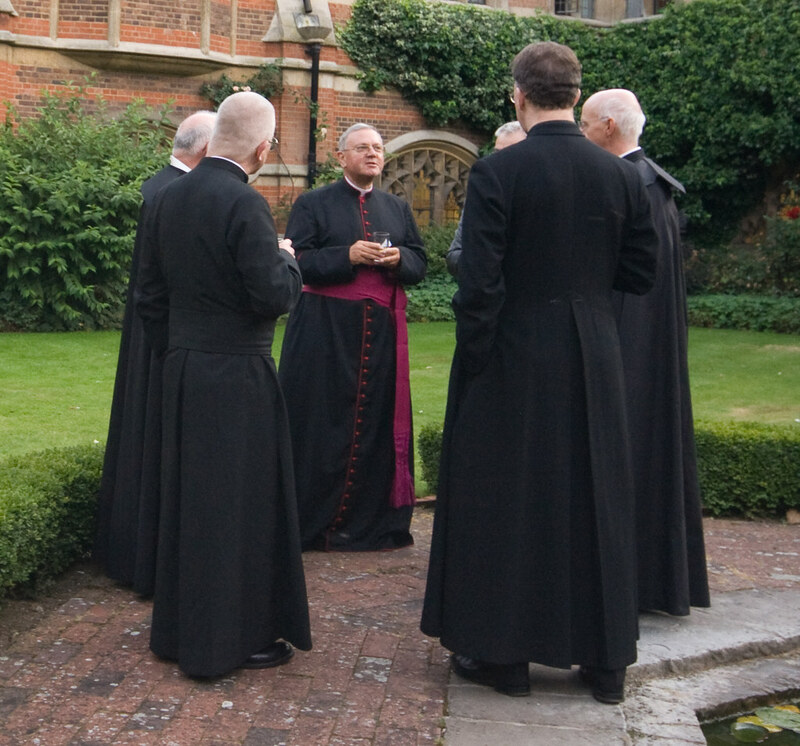 This is very useful for demonstration purposes and even more so for private Masses at any venue where a number of priests are gathered for any length of time. 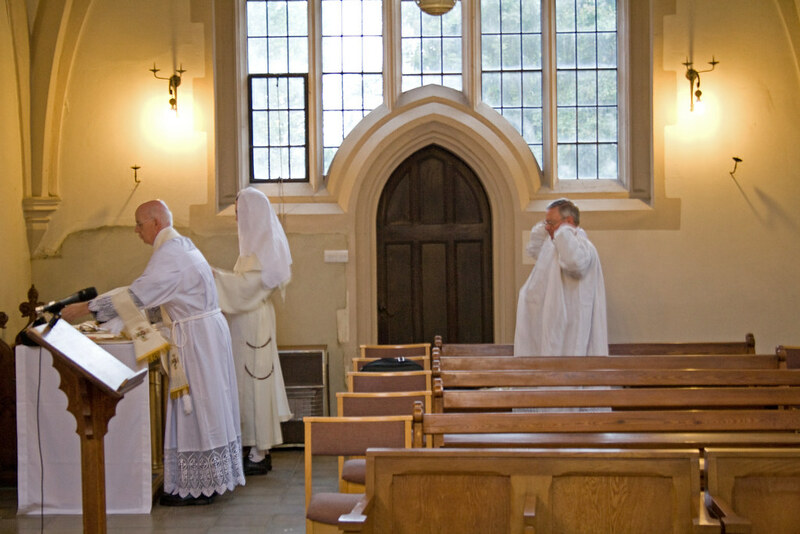 Each morning we had three 'sittings', if that is the right word, starting at 6.15 am, for private Masses before breakfast, and the laymen from the LMS Committee who were present, including me, served one Mass after another, for the expert priest trainers and for the less experienced priests alike. 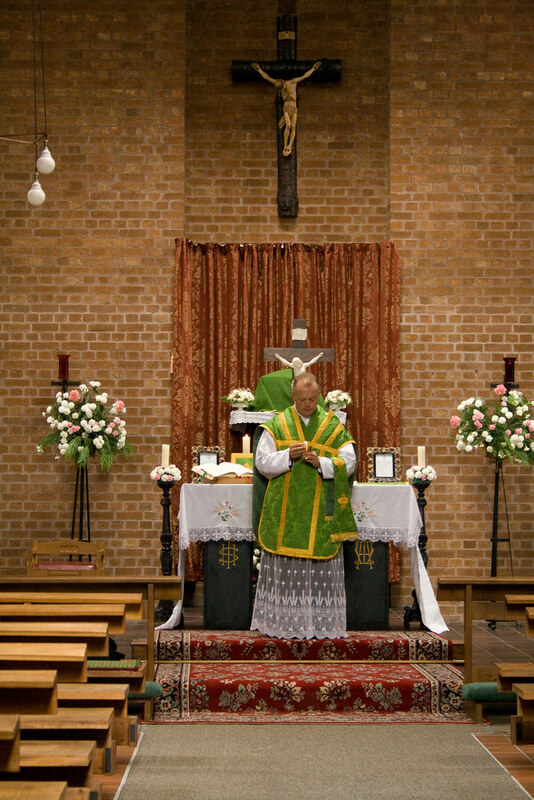 By the end of the week seven priests had said their first EF Mass, with a 'assistant priest' acting as MC in addition to the server. 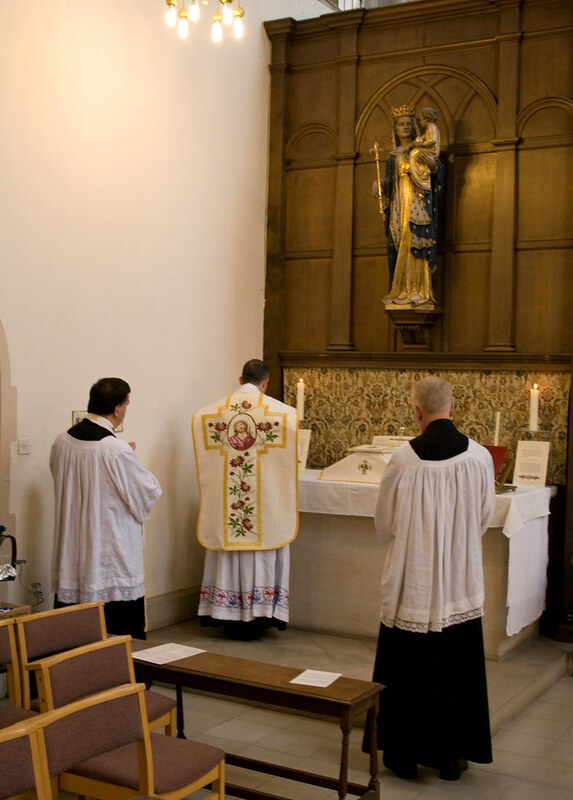 Getting up at dawn to serve Mass before breakfast is something generations of school boys did; I am too young to have experienced it - until this year, first at Ushaw, and now at London Colney. It was a wonderful experience, especially to do so in the context of this conference, in which the recovery of tradition is so vividly taking place. 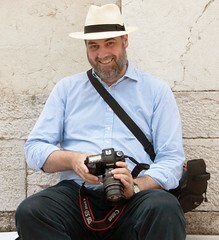 I am in the course of uploading photographs onto Flickr, and will be posting more over the next few days. This is being widely reported on the internet. Here's the full text. I am writing with regard to your leader “The old rite put in its place” (8 August). 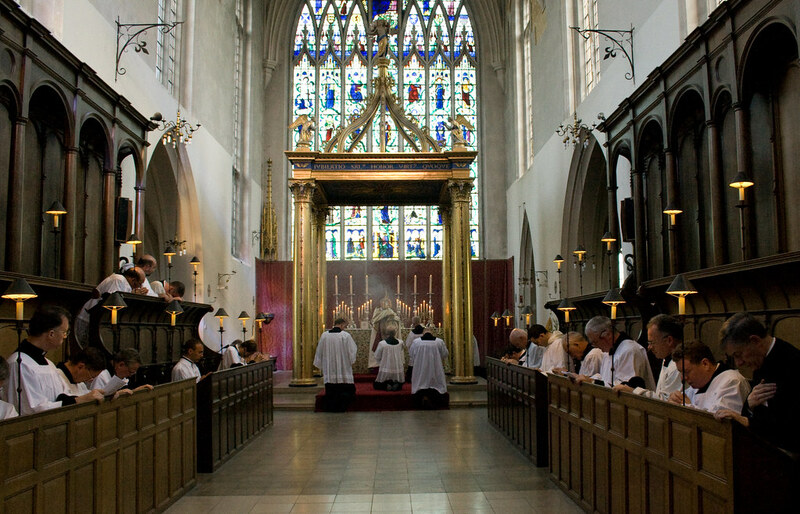 In his message welcoming priests to the training conference provided by the Diocese of Westminster in conjunction with the Latin Mass Society, Archbishop Nichols expresses his gratitude to those priests who have given up their time to respond to a need in the Church today. 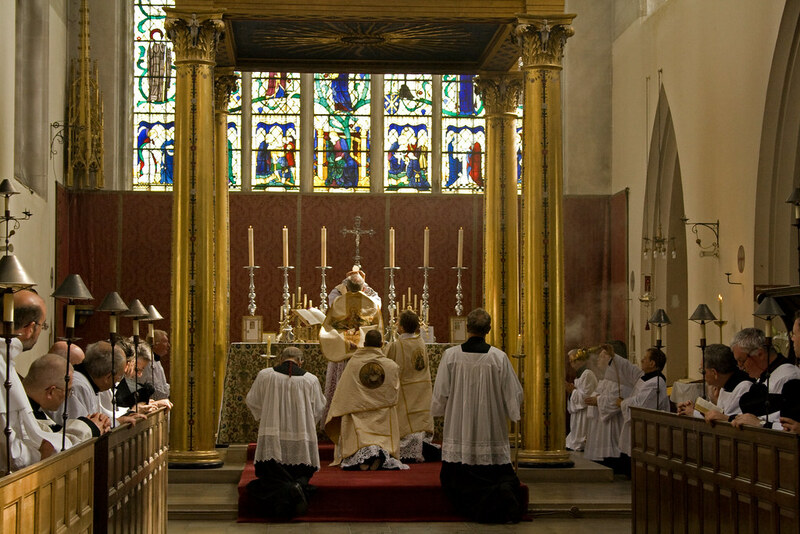 By providing this conference for priests wishing to learn the extraordinary rite, the Diocese of Westminster is not only affirming the import ance of the worthy celebration of the liturgy and the proper attention that priests should pay to good celebration but also reminding us that the diocesan bishop is the moderator, promoter and guardian of the whole of the diocese’s liturgical life. He is not “seeking to nip potential schism in the bud” or suggesting that the place of the Tridentine Rite is “necessarily marginal”. Just as Pope Benedict pointed out in the letter he sent to the Church’s bishops to accompany “Summorum Pontificum”, so the archbishop notes the relationship between the ordinary and the extraordinary forms. Above all he emphasises the importance of the Mass as the “source and expression of the unity of the Church”. 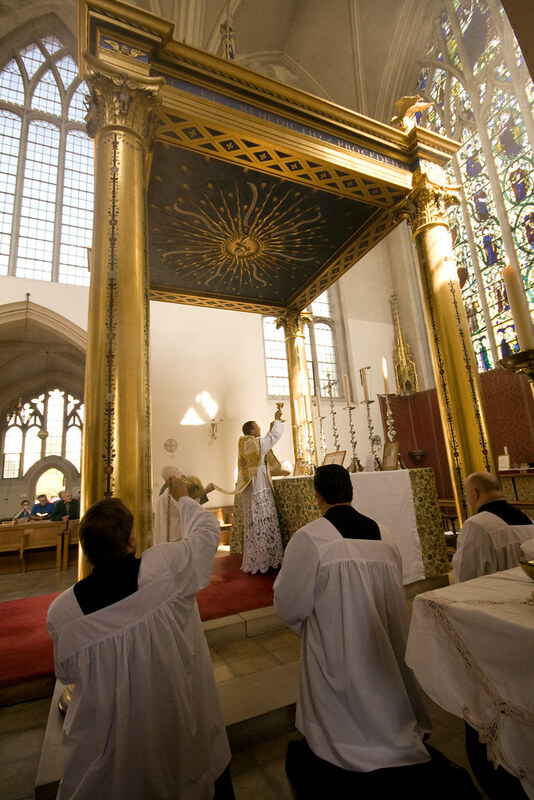 In this Year for Priests, Archbishop Vincent recognises the responsibility priests face whatever the form the liturgy takes – the active participation of all. This is an idea, common to papal teaching on the liturgy from the beginning of the twentieth century. This “active participation” has always been understood to be internal and external. To reduce participation to solely external signs is both a simplification and a misguided attack in the “culture wars” you seek to avoid. Ruth Peynton, a well known and much appreciated member of the Traditional community in Oxford, died on Monday, with her family around her. She was 94, and had just received the sacraments from Fr John Saward. Her funeral Mass will be on Wednesday 2nd September at 11am in SS Gregory & Augustine's. It will be sung. She will be buried in a village in Gloucestershire. It was a privilege to know Ruth, who had seen so much come and go. We recently worked out that her father was a rough contemporary of my grandfather as an undergraduate in Oxford, before the First World War. She arranged an invitation for me to give a talk on the Catholic Martyrs of Oxford to the residents of her sheltered housing complex. This was a great success and on the strengh of it I was invited to give another, to another group, and then another and another. I've now given versions of this talk six times, and have another session in my diary. I had no idea there were so many groups of retired people meeting regularly to hear invited speakers, but it seems they swap names of good speakers. 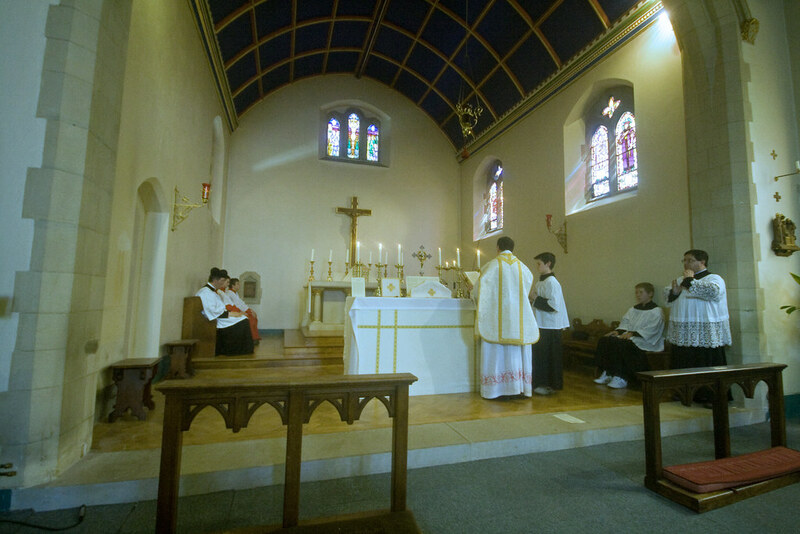 We arrived Friday afternoon and were able to assist at a Low Mass in a side chapel of the modern shrine church, said by the Parish Priest, Fr Jason Jones. Although the church is very modern indeed, it is filled with devotional items of above average artistic value - notice the excellent Infant Jesus of Prague in the above photograph, for example. 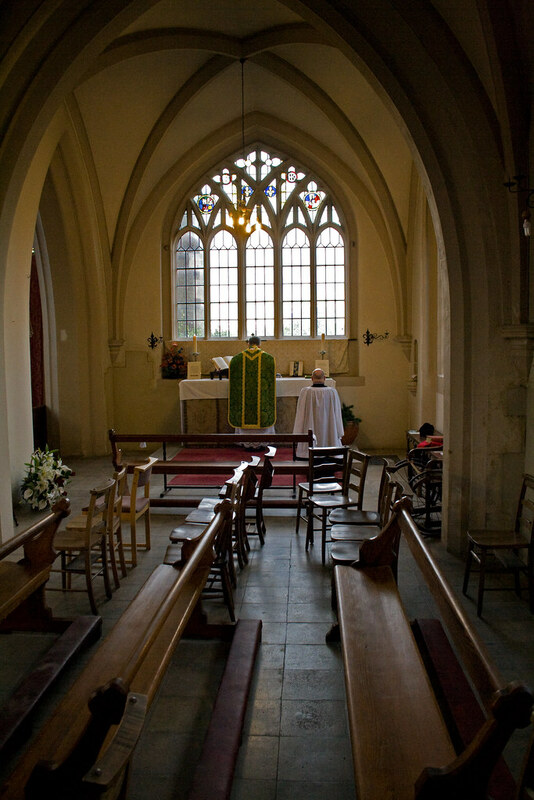 The church very much has the appearance of being appreciated and looked after. 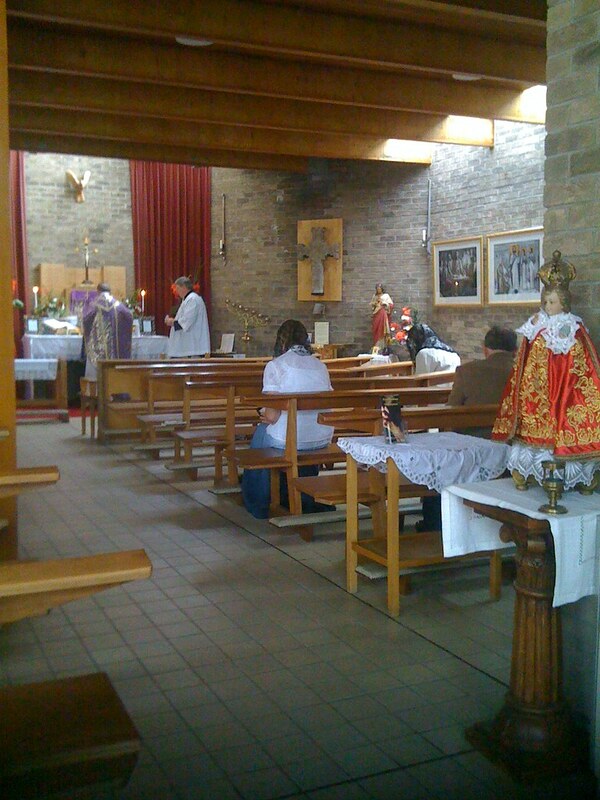 On Saturday we returned for the Pilgrimage itself, which included Mass at 12 noon and Benediction after refreshments in the large parish hall. The shrine is in a small building of its own outside the church, and the procession at the start of Mass visited the shrine before going up to the altar. It was extremely well attended, with more than 60 people present. Two of the servers, and a young lady in the congregation, has attended the St Catherine's Trust Summer School, and it was good to see them again. 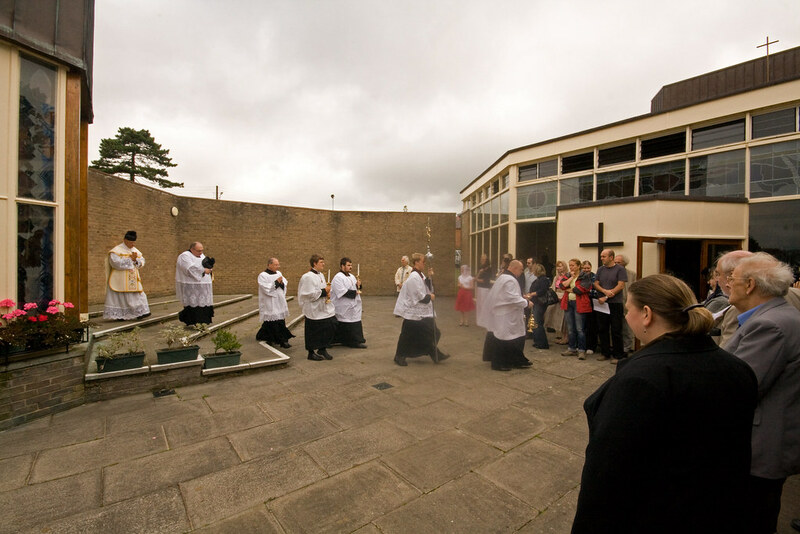 Fr Jones had been active in encouraging them to go, and the community had raised money to make it possible. Here is a photo of Benediction. The original image, predictably, was destroyed at the Reformation - perhaps one of the ones burnt by the Thames in Chelsea. 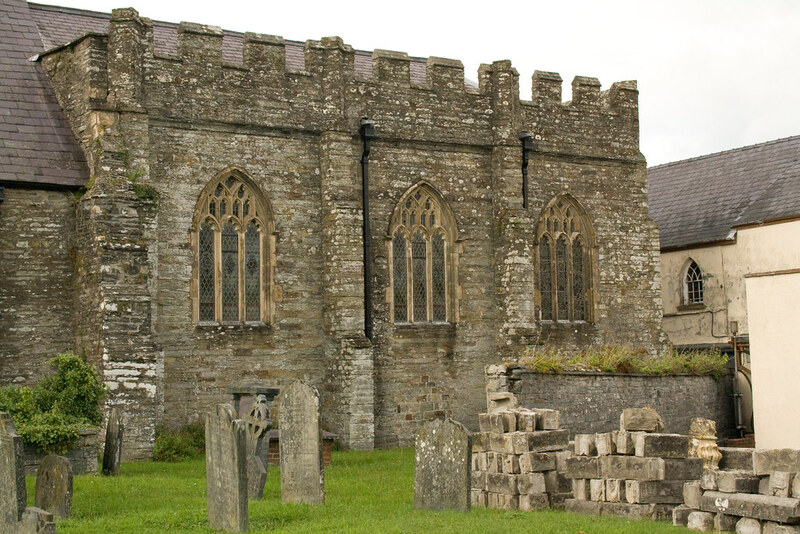 The original shrine was in a purpose-built Priory church of St Mary, now an Anglican church the other side of Cardigan. 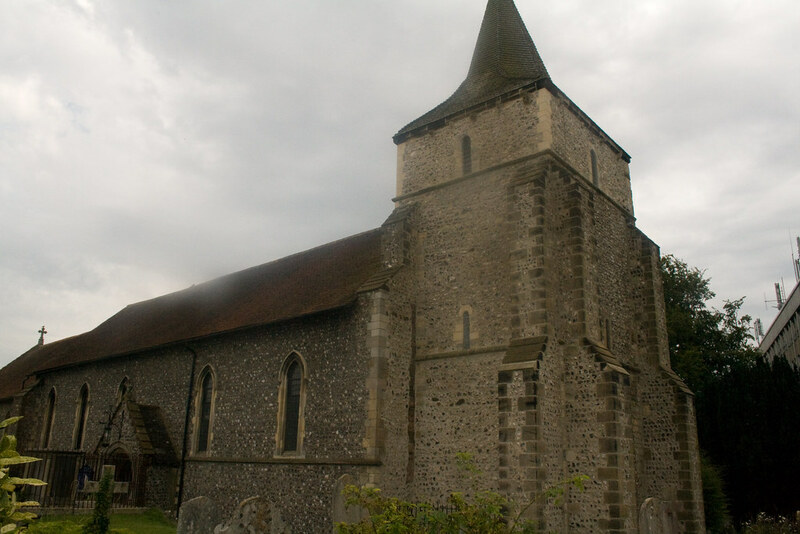 Little of interest remains, but the Medieval chancel survives, and that is where the shrine had been. Here's my own photo of the statue. The next day, Sunday, we attended another Mass celebrated by Fr Jones, this time in his second parish, Our Lady Queen of Peace, Newcastle Emlyn. Again, a modern church with some very traditional things going on in it! 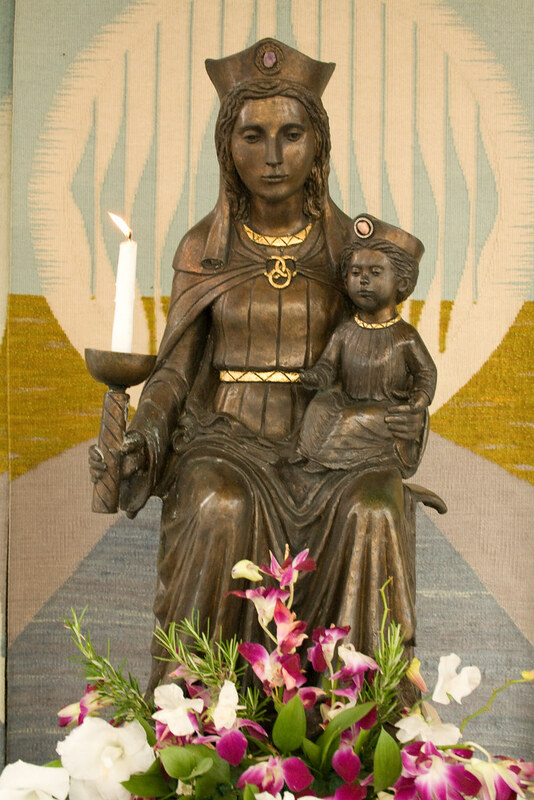 There are more photographs of the Pilgrimage here, and of Our Lady Queen of Peace here. There is a British Chapter each year, which is sponsored by the LMS. 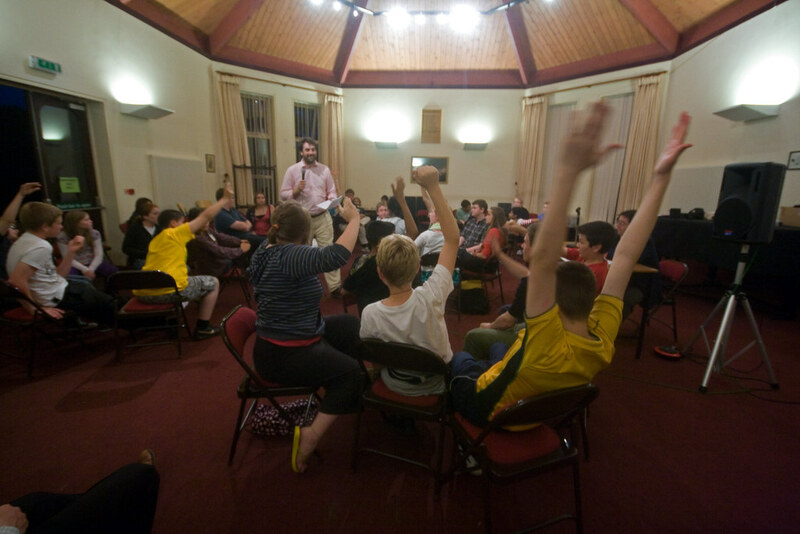 Last Thursday, the Feast of the Transfiguration, the Summer School went to Lewes. There we were welcomed by the Parish Priest, Fr Richard Biggerstaff, who has been opposing the notorious local 'No Popery!' festival each 5th November with his own 'Know Popery!' campaign. 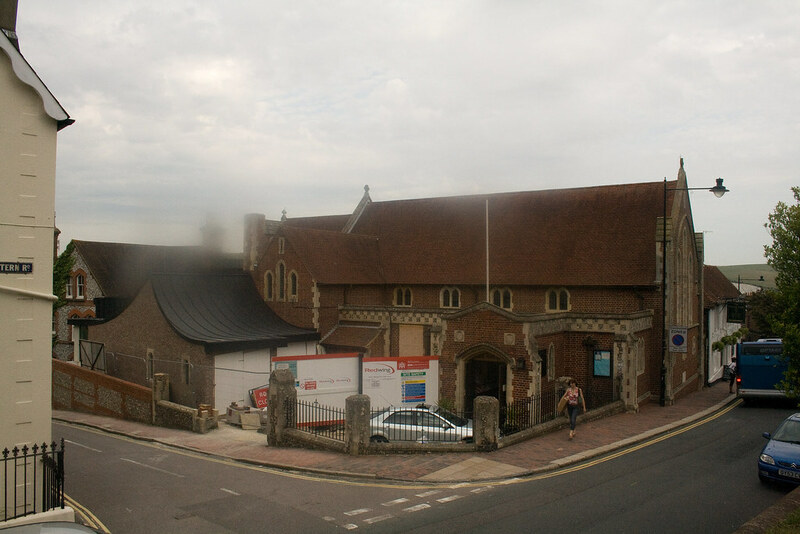 Fr Biggerstaff is currently building a new and enlarged parish hall next to his attractive historic chuch, which is dedicated to St Pancras in memory of the first church in Lewes, in Saxon times, and the Cluniac monastery which succeeded it, which had that dedication. St Pancras, an obscure Roman Martyr to many, a railway station in London to probably far more, was greatly venerated in the early Middle Ages. Across the road from the Catholic Church is a surprisingly 'high' Anglican Church, of St Anne, a Medieval church whose Rector kindly showed us around. It contains the cell of a 13th Century Anchoress and an interesting Easter Sepulchre. The great Abbey of St Pancras, alas, now lies under the railway line. But Lewes is a charming town, where St Richard of Chichester performed a miracle to help some poor fishermen get a good catch of fish in the river. It became a hotbed of Protestantism later, however, and as well as being the scene of the burning of 17 heretics under Mary Tudor, saw many ugly scenes between different Protestant factions, including the near-lynching of a high-church vicar during the Civil War, and a major protest against the building of the first Catholic church. I have written more about it all here. As always the Summer School was hugely enjoyable. We had 36 students and about a dozen staff. Numbers were down on last year because of the later date - entirely in August - which was the earliest our venue was able to offer us this year. But the atmosphere was particularly good this year, with the students throwing themselves into the academic and artistic tasks and the activities. 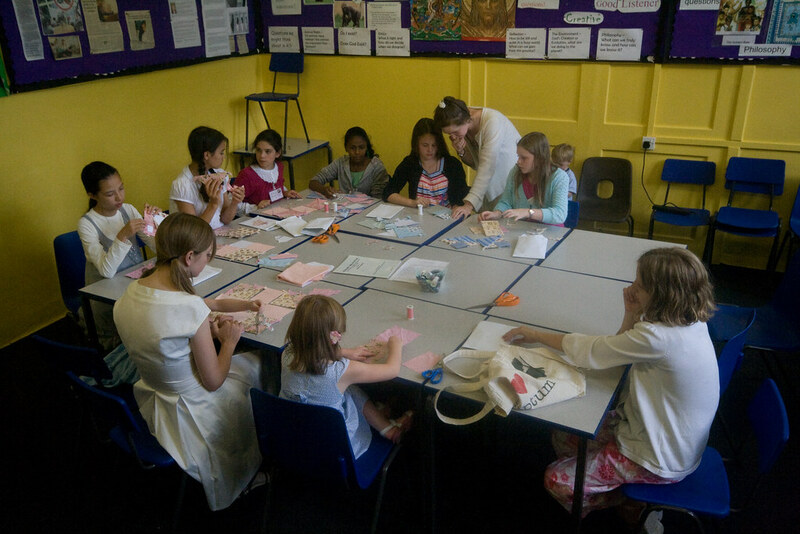 Most days of the Summer School are organised like a school day: classes in the mornings, Sung Mass, games and activities in the afternoon, some more classes, dinner, and some evening activity. 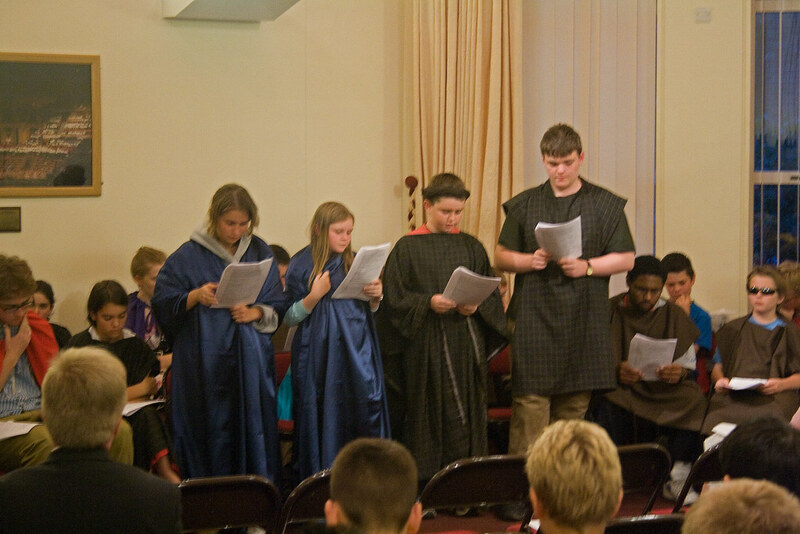 The classes included Catechesis, History, Philosophy, Latin, New Testament Greek, Gregorian Chant and Polyphony. 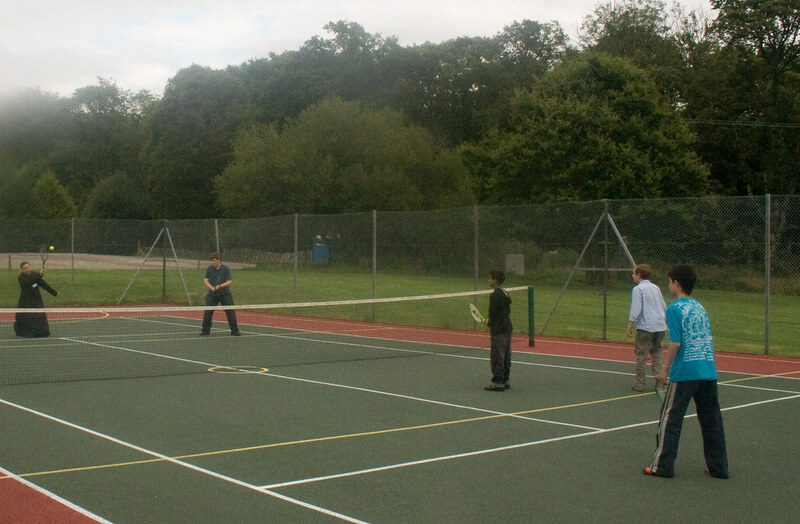 In the afternoon there was tennis and football, country walks and a very popular sewing group. In the evenings we had two talks from visiting speakers, Fr Rupert McHardy, who spoke about St Phillip Neri, and Mr James Bogle, who spoke about Blessed Karl of Austria. Each day ended with Compline. 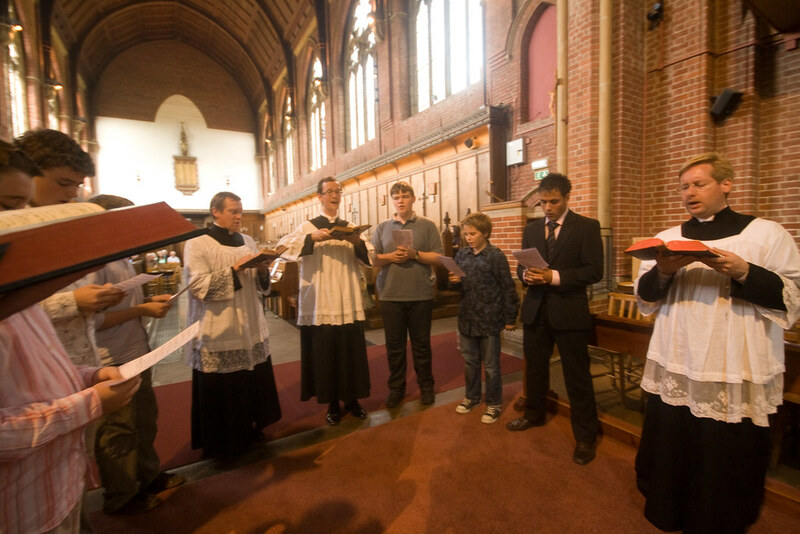 During the week we were training some of the boys to serve and MC, and others to sing the some of the propers with the small liturgical schola who accompanied the Masses throughout the week. The finale of the week included a staged reading of a radio play, one of Dorothy Sayer's wartime plays about the Passion. We also had a very enjoyable quiz, which demonstrated that the students really had been taking in some of the things we'd been teaching them. I was the Quiz Master. 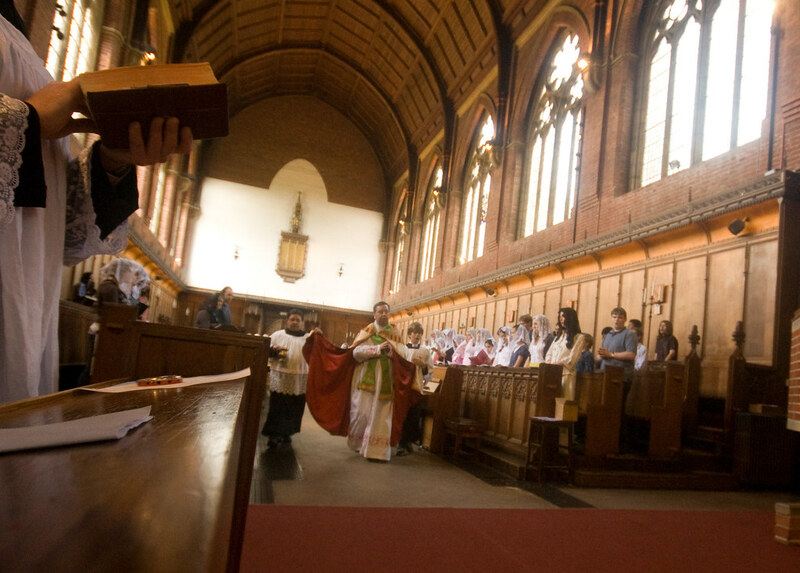 The Summer School is subsidised by generous benefactors, including the Latin Mass Society, making it possible for us to accept students regardless of their ability to pay. We ask merely for a donation in accordance with parents' means; these contributions usually ammount to about a third of the cost of the school. The staff are all volunteers; the main cost is the accomodation.